Cold and flu season and seasonal allergies leave many of us with chest and nasal congestion. This page contains homemade decongestant recipes. Every once in a while I feel congested, or have post-nasal drip, two conditions which do not let me sleep! In addition, I tend to have trouble falling asleep anyway, so I always keep some Chamomile or Sleepy Time brand tea on hand. 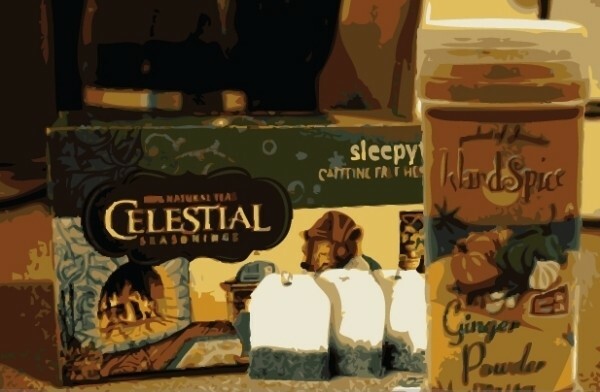 The other night, afflicted as I was with this, I had a bout of inspiration; by adding powdered ginger to my "sleepy" tea, I felt my nasal passages clear right up! I was soon able to sleep again. Ginger powder and mint leaves can be found at almost any supermarket in the spices section, and definitely in the bulk aisle of any Whole Foods or natural foods store. Lavender can generally be found at bulk sections of natural food stores. If you find it in the spices section of a supermarket, be sure it's only ginger powder with no additional spices! One can also use ginger root, though it takes a bit longer to steep. Above values are suggested - for sensitive stomachs I would recommend going easy on the ginger powder, and for sensitive tastebuds I would recommend going easy on the lavender. Simply mix all ingredients together, let it steep, and drink! It's cold/flu season, and I am prone to bronchitis. But I have found an inexpensive herbal mixture that loosens up all that gunk in my lungs before it starts to be really troublesome. Take a teaspoon or so of the Chinese 5 Spice mixture that you find in the grocery store and add 1/2 tsp. of dried thyme in a large cup. Add boiling water and let steep to create a tea that tastes awful, but works like a charm!